We considered construction materials, security features, reliability ratings, and accessibility to bring you the most comprehensive list of quality gun safes for your car. When shopping for a car gun safe, the most important things to consider are whether you’re more worried about security or accessibility, and whether you’re looking for a permanent car fixture or something that’s easily moveable. If you’re just looking for a safe way to transport your weapon to the gun range or a way to secure your gun in your luggage while traveling, you’ll want something smaller and lightweight, with a simple lock or code. But if you’d rather have a permanent car fixture that gives you quick access to your gun for self-defense, you can invest in something bulkier, with easy-open options like a biometric scanner. Dimensions 5.25 x 12.5x 10.5 in. 1.5 x 6.5 x 9.5 in. 11.5 x 9.0 x 2.75 in. 10 x 7 x 2 in. 11 x 8.5 x 2.25 in. 2.5 x 6.5 x 8.75 in. 6.6 x 9.7 x 2.2 in. With durable construction and reliable simplicity, the Fort Knox lives up to its namesake and earns the top spot on our list. Its mechanical lock and tamper-resistant design make it a great choice for security, but it tips the scales at a whopping twenty-two pounds. While it does have holes for mounting, it doesn’t come with the hardware needed to secure it to your car. The Simplex mechanical lock on the Fort Knox has over 1,000 possible code combinations, which means potential thieves won’t be able to crack it without some serious trial and error. 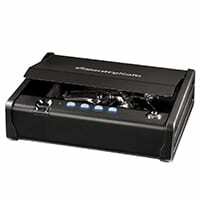 It’s battery-free, so you don’t have to worry about the lock losing power or malfunctioning. The already durable design was given an upgrade in 2017 to make it even more tamper-resistant, and we’re impressed by the hefty ten-gauge steel construction. Heavy doesn’t mean awkward when it comes to this safe: gas struts help the safe’s door raise and lower safely, making it easier to open and close. Fort Knox attaches a lifetime warranty to its safes and internal locking mechanisms to warrant them “free from defects in material or workmanship” for as long as you own them. Because Fort Knox manufactures all of its safes right here in the US, the company maintains a high standard of quality control and is highly responsive to concerns about design flaws in its products. With a price tag of around $250, the Fort Knox PB1 is definitely an investment. The smooth steel underside of the Fort Knox safe makes it prone to sliding across carpeting. If you’re going to keep it in your car, we recommend purchasing bolts or screws and using the mounting holes in the bottom to secure it to the floor of your vehicle. The Nanovault’s small size and light weight make it a good, basic, and inexpensive option for traveling, but its insubstantial construction and easy-to-cut cable will probably only deter the casual burglar. We like its simple design that’s straightforward enough for anyone to use. At only 9.5 x 6.5 x 1.5 inches, the Nanovault is about the size of a hardback book, making it just big enough to fit a gun, but small enough to fit neatly in your luggage. A 1,500-lb. test cable is included with the Nanovault, making it easy to secure to a fixed object in your home or car. The Nanovault’s five-year warranty covers loss against fire and burglary for five years, and it also protects against vault defects for one year. 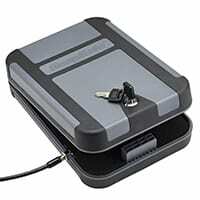 At around $30, the Nanovault is one of the most budget-friendly gun safes on the market. It’s an ideal option for those who need an inexpensive way to secure their firearm. No need to memorize a code or worry about programming a fingerprint—the Nanovault’s keyed lock is straightforward, so it’s easy to access your gun in a hurry. The keys for the Nanovault have a flimsy plastic casing, and they might not hold up well if they’re attached to the keychain you use every day. With a decent pair of bolt cutters, a burglar could cut through the security cable with no problem, and anyone with lock picking experience could make short work of the lock on the Nanovault. 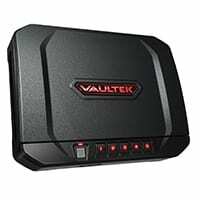 Vaultek upgraded their safes in 2017, adding security features to make them more tamper-resistant. The VT20i biometric gun safe has all the bells and whistles—including the incorporation of smart technology—but you’ll pay a premium for all the extra features. The Vaultek’s anti-pry bars close any gaps between the lid and the main compartment so it can’t be pried open, and special anti-impact latches prevent the safe from popping open when hit or dropped. The hinges are mounted on the interior of the safe so they can’t be tampered with. Biometric technology allows you to program in your fingerprint so you can access your safe by swiping your finger across the scanner. If you can’t use the fingerprint scanner for some reason, the Vaultek comes with both a coded keypad and backup keys for manual unlocking. The free Vaultek app allows you to do a number of things from your smartphone. You can view your safe’s history to see when it was locked and unlocked, check the battery status, remotely unlock it, and turn the keypad sound on and off. The Vaultek has an interior LED light that automatically turns on when the lid opens, making it easy to see your valuables in the dark. You can program up to twenty different fingerprints in the Vaultek, giving multiple users access to the gun safe. If you’re in a dangerous situation, you might not want to announce that you’re accessing your gun safe with loud beeping from the scanner or keypad. The Vaultek allows you to toggle off the sound, so you can silently access your firearm. At more than $250, the Vaultek is the most expensive gun safe on our list, but its fancy features and anti-tampering qualities may make the price tag worth it. As much as we love the idea of biometrics, the reality is that they are notoriously unreliable. If your finger is wet, dirty, or even has a paper cut, your biometric scanner may not work when you need it most. The Vaultek requires a lithium ion battery that needs to be recharged every four months. 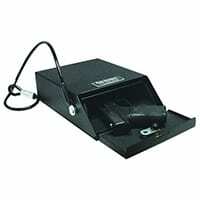 The charging kit is included with the safe, but it might be more hassle than you want for a gun safe. No matter what kind of vehicle gun safe you get, take the time to practice opening it under a variety of conditions, and practice using all available methods to open it. Depending on the style of safe, this may include using a biometric scanner, keypad code, or actual key. If you're right handed, try opening it with your left hand, and vice versa. Being comfortable with your safe could save you valuable seconds when it really counts. If you’re looking for something truly lightweight and easy to carry, the SnapSafe Treklite is ideal. At only 1.6 lbs., it’s one of the lightest car gun safes on the market, but it’s not flimsy: it’s made of an impact-resistant polycarbonate, with the same strength as its heavier steel counterparts. It retails for less than $20, and it comes with a security cable to attach to your car. Like the Nanovault, it may be compromised by someone who’s prepared with tools, but it’s a decent deterrent for the smash-and-grab criminal. The “no eyes” keypad on the GunVault is the next best thing to biometrics if you want quick access to your weapon. With over twelve million code combinations and a built-in tamper-detecting lockout feature that kicks in after several failed attempts to enter the code, it’s unlikely that a burglar would be able to thwart this safe. 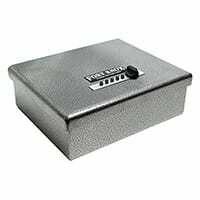 The safe also includes a backup override key and a security cable, but it doesn’t include the nine-volt battery required for the keypad operation, and its twenty-gauge steel construction is the weakest of the safes on our list. Unlike most of the portable gun safes on the market, the Gunbunker GS-1’s unique design is more like a garage than a box: it lets you open the side of the box and slide the gun out, rather than opening the entire box like a briefcase. If you put this gun safe under your car seat or in the center console, you can easily unlock the safe, flip open the door, and remove your gun or valuables without having to remove the entire safe from its location. It’s the most compact of all the safes on our list, but that also means it may be a tight fit for your gun. 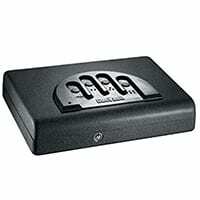 The SentrySafe Biometric Pistol Safe has a lot of the same features as the Vaultek Biometric Safe, but without the extra bells and whistles and, most importantly, without the tamper protection upgrades. The safe has a gap big enough to allow the inner latch to be released with the right tools, and you can only program two fingerprints. 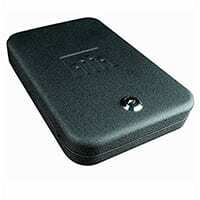 But at around $130, it is a good choice for those who like the ease and convenience of a biometric scanner. No security cable is included, but it does have screw holes for mounting. What is the difference between ten-gauge steel and twenty-gauge steel? As a general rule, the higher the gauge, the thinner the steel. A ten-gauge sheet of steel is approximately 0.14 inches thick, while a twenty-gauge piece of steel is 0.38 inches thick. The lower the gauge, the thicker and heavier the steel will be. What’s the difference between a TSA-certified gun safe and a California Department of Justice-certified safe? TSA gun safe standards are fairly simple: the firearm must be in a hard-sided, locked case. The California Department of Justice (CDOJ) standards for gun safes are more stringent and include specifications like the number of possible combinations for a combination lock, thickness and number of locking bolts, and a minimum thickness of twelve-gauge steel for the shell. Many gun owners consider the CDOJ standards to be the minimum quality standards for gun safes. Visit TSA.gov to find out more about the guidelines for legally transporting firearms and ammunition by commercial airliner. What is the difference between a car gun safe and a console vault? A console vault is designed based on the specifications of your vehicle’s make and model in order to fit inside the center console. Most have keyed locks and are a semi-permanent car attachment. A car gun safe is usually a notebook-shaped box that can fit underneath the seat of your car, and it’s often attached by a cable. Some car safes are stored in the trunk and bolted down. What size should my vehicle gun safe be? Most car gun safes and travel safes will be large enough to fit an average 9 mm handgun like a Glock 17 (total length: 7.3 inches) or a .38 like a Ruger LCR (6.5 inches), which are the most common calibers for everyday carry. If, however, you need to store something larger, like a Desert Eagle (10.6 inches) or a larger revolver, pay close attention to the dimensions of the safe you choose, as you may need something larger than average. To research the best gun safes, we compared the various makes and models available, talked to gun owners about the features that are most important to them, and studied a wide variety of reviews from firearms experts and locksmiths. Visit our methodology to learn more. If you want to use a car safe for your everyday carry firearm, be sure to get a safe or console vault that will fit both your gun and your holster. It's much easier—and safer—to remove your entire holster with your gun inside rather than having to draw your weapon when you're sitting in the cramped quarters of a car.